This instrument was purchased in 1870on the occasion of the total eclipse of Sun of December, 22nd (see Sec. 3), but it did not arrive in time to be used in the scientific expedition. It was made in Leipzig by Tauber, on the design of the Austrian spectroscopist J.C.F. Zöllner, famous for having designed spectroscopes and photmeters. 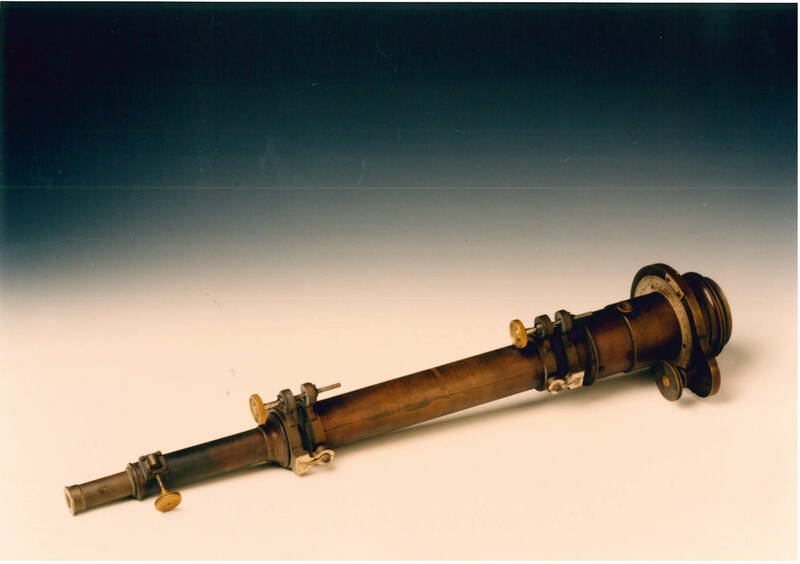 Starting from March 1871, it was attached to the Merz Equatorial of Palermo Observatory [see Pa. 15] and used by the astronomer Pietro Tacchini (1838-1905) for his studies on solar prominences. Thanks to the observations made with this instrument, Tacchini was able to make one of the first classifications of solar prominences [see Pa. 12], which was adopted also by Angelo Secchi [see Pa. 07] at Collegio Romano Observatory. In the same year, the two astronomers started a series of simultaneous spectroscopic observations of the solar limb, in view of the start of a program for monitoring solar activity. The idea of extending this program to other astronomers led, in October 1871, to the establishment of Società degli Spettroscopisti Italiani (see Sec. 5), whose Memorie (see Pd. 04) represented the first international scientific journal of Astrophysics. It is a direct-vision spectroscope, having two trains of five prisms. The instrument, whose total length is 55 cm, is divided into three sections. The first one includes the slit (whose width can be regulated by a screw) and the collimator (a lens aimed at obtaining a coherent lightbeam). At one end is a flange with an adapter for connection to the telescope a graduated circle in silvered metal, bearing a 0-360 degree division, with numbered 10-degree segments, enabling the angular position of the examined prominence to be measured; the spectroscope can be rotated by a screw, thus allowing the slit to be placed in a tangential or normal position with respect to the solar limb. Bibl. : Foderà Serio, Chinnici 1997, pp. 131-32; Chinnici 2008a, pp. 40-41; 56; Chinnici 2008b, pp. 396-407; Chinnici 2000; The Popular Science 1882, p. 287.